I have a question for you. 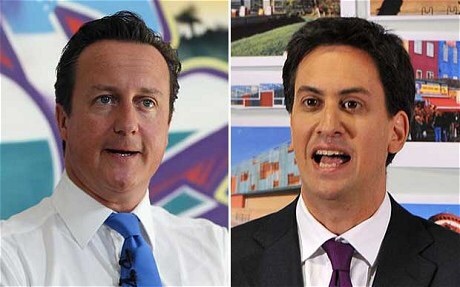 Why do David Cameron and Ed Miliband want to be Prime Minister? Try and answer it. I am going to venture that if you asked that question of even the most knowledgable political pundits they can answer it for Miliband but not for Cameron, I mean, not properly. Watching the increasingly lacklustre Conservative campaign for re-election and comparing it with the increasingly confident and self-assured Labour campaign, which is winning both the ground and air warm I would venture to suggest that part of the reason for this is that Labour supporters are united behind a leader with a vision and a reason to lead and Conservative supporters just don’t have that. Bill Clinton is reported as saying that you have to put even more effort into being re-elected than you do to being elected in the first place. David Cameron is simply not managing that. His performance in the interview with Jeremy Paxman and in the mass debate were almost entirely backward looking, based around saying that “I’ve done this, let me continue doing it”. Miliband, meanwhile, is fired by a purpose. He wants to reshape how the country works and who it works for. Accepting that we are stuck with capitalism as a way of creating wealth, he wants to reshape who capitalism benefits. I am not commenting in this blog about the rights and wrongs of that. I am merely pointing out that it is clear to me what he wants to do and his policies are consistent with that. We already know how strongly he feels about the need for change, as he was prepared to risk his relationship with his brother to put himself in a position to achieve that. The Conservatives demean and reveal themselves by calling that ‘stabbing his brother in the back’ as they are essentially saying that primogeniture (who was born first), should determine who leads a party, not merit. I feel that David Cameron, having started his leadership back in 2005 with a sense of real reforming purpose, both in terms of how the Conservative party is perceived and also how the country is run (‘there is such a thing as society, it’s just not the same as the state’), is now wanting to carry on being Prime Minister because, well, he likes being in 10 Downing Street. There is no real sense of purpose. No real sense of passion about how he can use his power as the leader of our country. There is plenty of passion about being IN power, but not what he might really achieve with it. It feeds into the tired stereotype people have of him as an Old Etonian who was born to rule and expects to be allowed to because of who he is. Miliband, meanwhile, has put himself out there, including bravely taking on the challengers in the opposition leaders’ debate, and every time he has the electorate are becoming more and more used to imagining him as Prime Minister. The increasingly panicked Conservative response, which seems to essentially involve insisting that a Labour government propped up by the SNP would lead the country into famine and pestilence, shows that they know just how well he is doing. Last week, the odds became properly entrenched in what seemed like a contradictory position, which was to become odds-on for Conservatives getting most seats whilst also odds on for Ed Miliband being Prime Minister. As an economics and politics teacher, I would find that result particularly interesting. If it happens, David Cameron would have only himself to blame. If you take over from one of the worst Prime Minister’s ever, inheriting in a country with a crippling deficit in the midst of a global recession, then clear half that deficit whilst bringing the country back to 3% growth, 0% inflation, adding 2 miliplion jobs and reducing unemployment to its lowest level since the 1970s, all the while facing an opposition leader that spent most of your Parliament a laughing stock, and you STILL can’t win, it’s probably you that is the problem.